Bill Hart-Davidson was recently invited by the College Conference on Composition and Communication to present an Ignite session about the story behind Eli Review. The ignite sessions were all focused specifically scholars are inventing new products. The materials from Bill’s presentation are included here. You can find links to the materials he references, his actual slides, and his presenter notes. My name is Bill Hart-Davidson and I’m proud to be here representing my colleagues Jeff Grabill & Mike McLeod to talk about our peer learning service: Eli Review. We want to thank Joyce for this event. We are proud and humbled to join this group of writing teachers writing software (and engineering hardware!). To understand Eli and what it does, it’s best to think about what it looks like to learn to write. Can you picture it? The ability to identify and learn, in a moment, from a more capable peer is a powerful thing. And it is no accident that we teach both dancing and writing in studios. We want those moments to happen. You know the moments I mean. 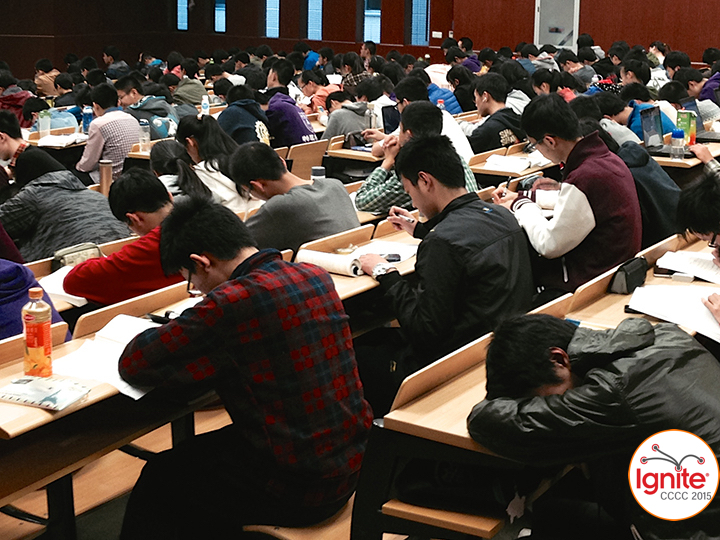 When, just for second perhaps, one student identifies that “more capable peer” – the one on the right foot – and then, even in the next measure, maybe those roles change. 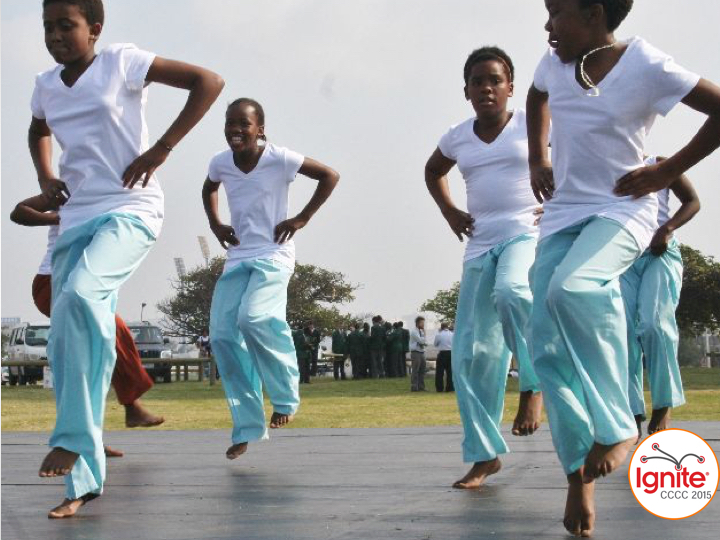 So much of the data available to the dance instructor – a function of the visible moves a dancer makes – is unavailable to me as a writing teacher in a standard writing classroom. 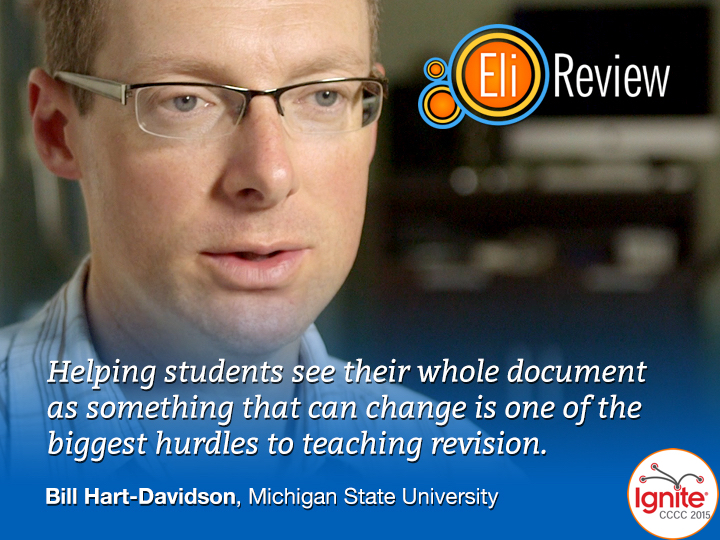 Eli was engineered from the ground up by writing teachers to help learners harness the power of feedback. 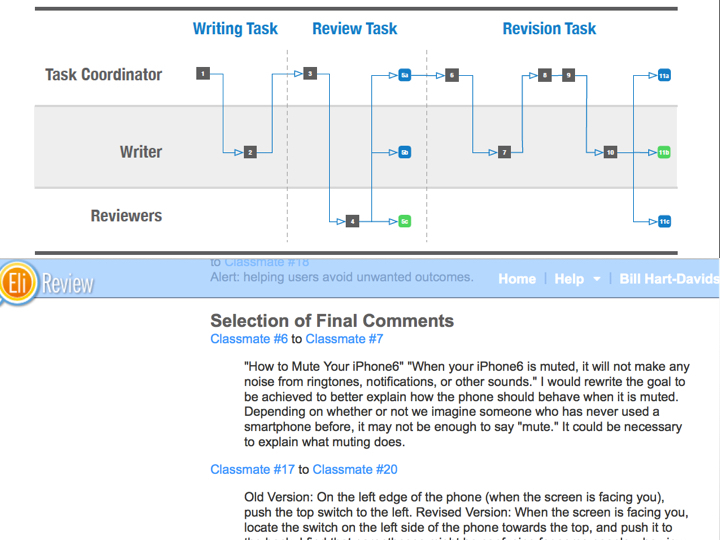 Eli puts a powerful set of coordination tools and reports in students hands. 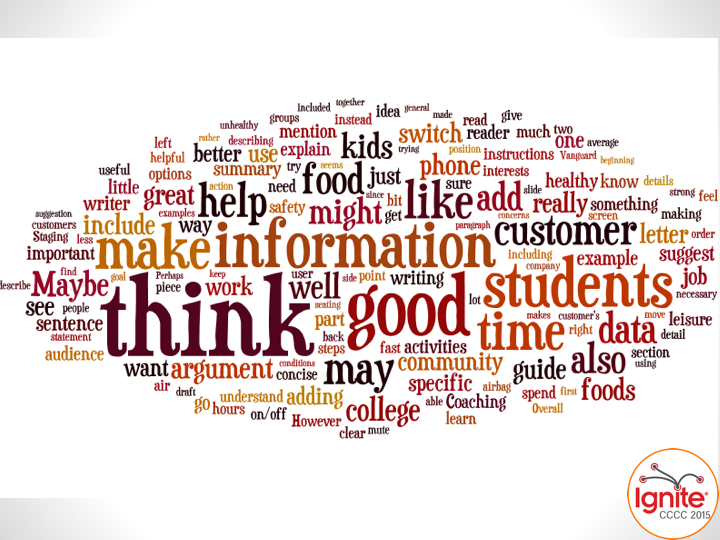 The result in a writing class: more time spent doing the things that matter most. Especially revision, review, and reflection. 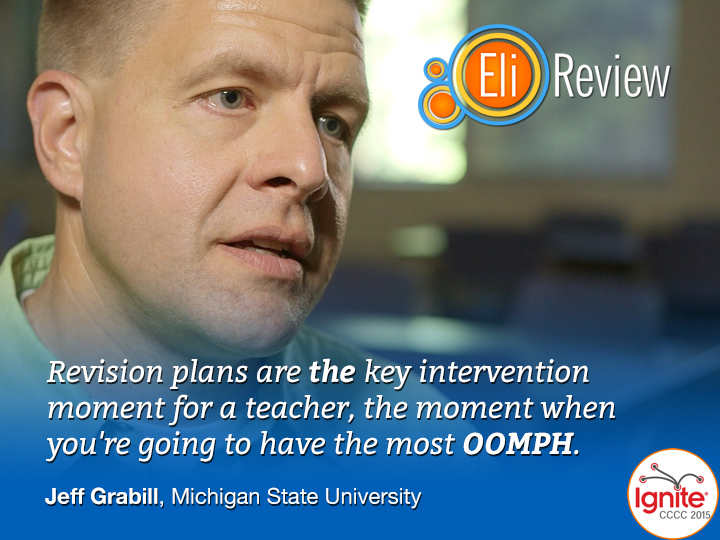 With Eli, I can see very quickly – within an hour – what kinds of dance moves my students are proficient in and where the group is struggling.I see it in the real-time displays of review data that Eli gives me. And, of course, students see it too. I can get them quickly thinking about the specific challenges of an assignment. First by coaching high-quality feedback and then by guiding the ways they select, prioritize and reflect on that feedback to revise. The result: the kind of AHA moments that comes from engaging a high-level revision can happen every day…and not weeks apart, but hours apart. Early, often, and consistently. Eli makes the writing studio work a lot more like a dance or yoga studio. The moves become visible for leaners to see, for teachers and students to talk about, and the dynamics of peer learning accelerate as a result. And it all happens not through some automation or algorithm. It happens because we use the digital space and the computer to transform the learning environment – whether the class is online or face-to-face – into one focused on and driven by high-quality formative feedback. 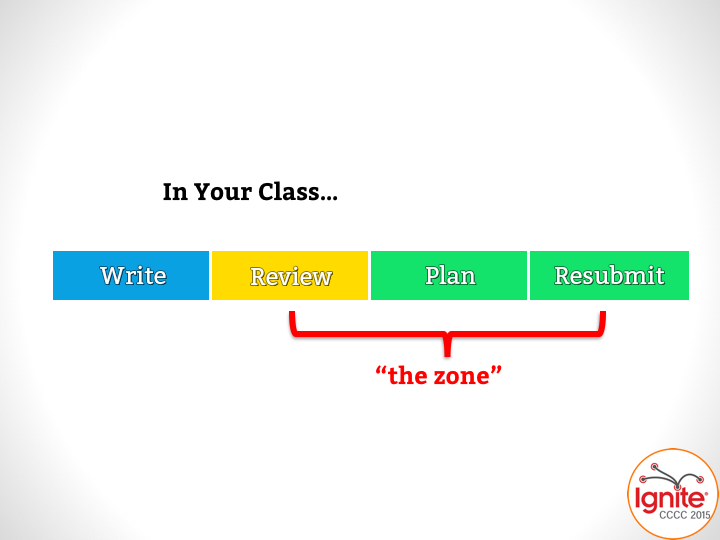 When writers move the feedback they receive into a revision plan and share it with me as a teacher, a feedback loop is complete that tells me something about their learning. Right that moment, I can evaluate what the student needs to keep going. Are they focused on the right criteria? 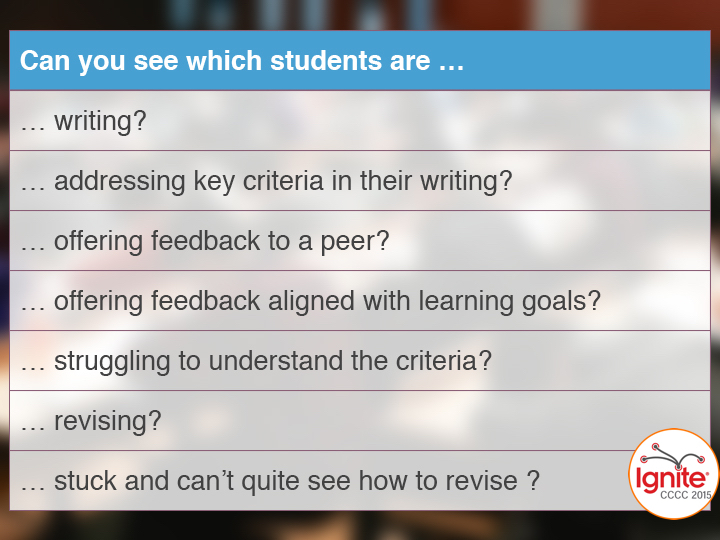 Are they revising based on higher-order concerns? Are they stuck and need my help? All those things that were invisible in the picture I showed earlier are now right in front of me. Updated in real time. Compiled to show trends for the whole group, and broken down into detailed reports for each individual too. Eli’s data displays make this kind of individualized instruction possible from day one of your course. If that sounds hard to believe, you should talk to teachers who have used it. It’s transformative. Not because it give you more control, but rather because it lets you give that control back to students where it belongs. 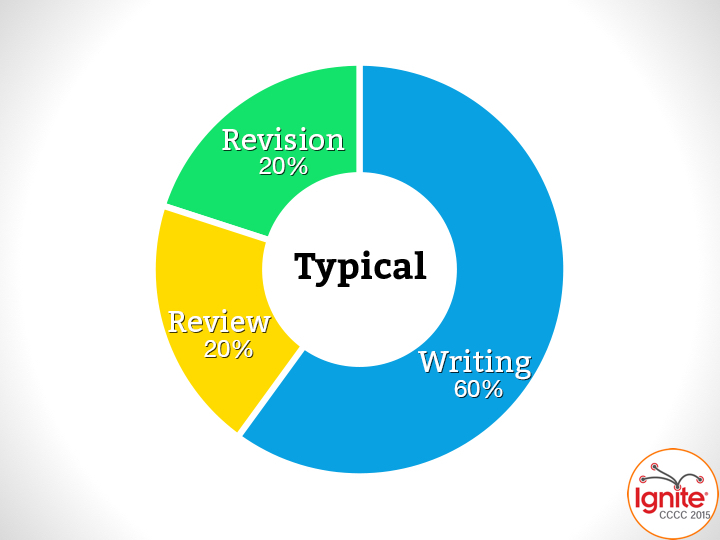 Many of our innovations in the teaching of writing have been aimed at gathering evdience. Portfolios. 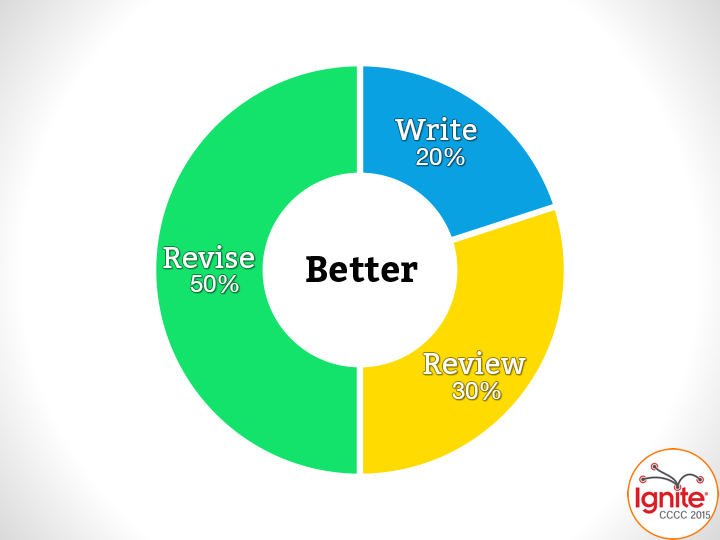 Holistic grading for summative evaluation. These are evidence of student performance. But never before have we created such a powerful tool for gathering evidence of learning. That tool is Eli. And we made it for you and your students. 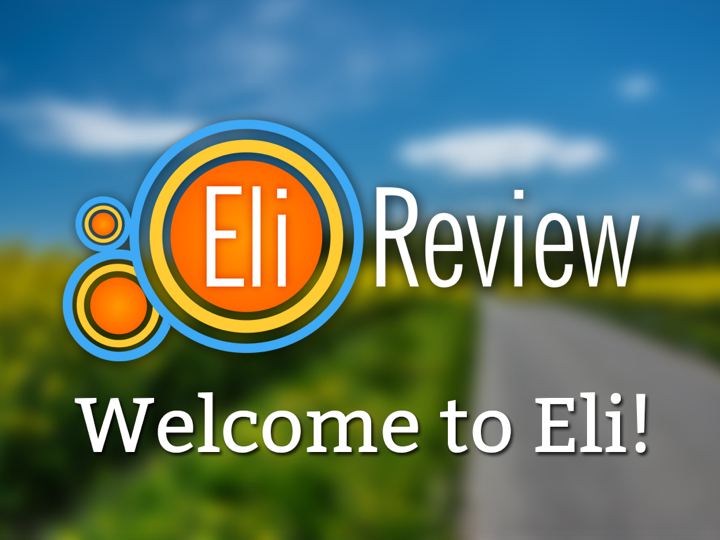 At the heart of every Eli review is an amazing resource – a network of writers and reviewers learning together. 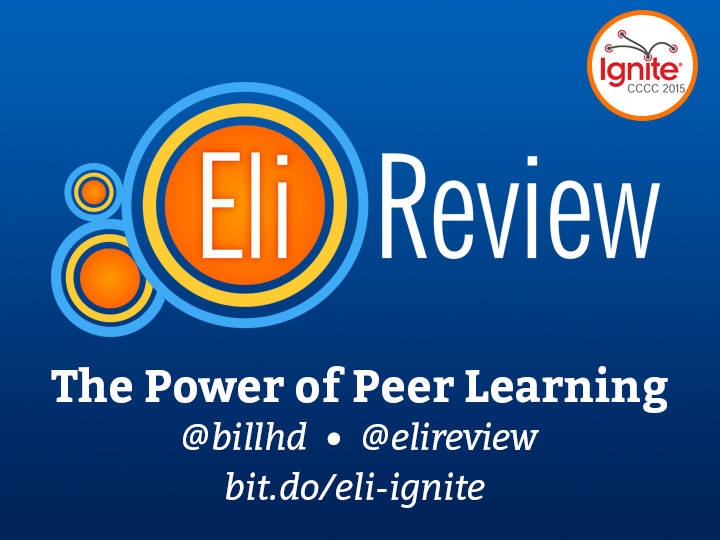 Eli makes that resource visible and available anywhere. 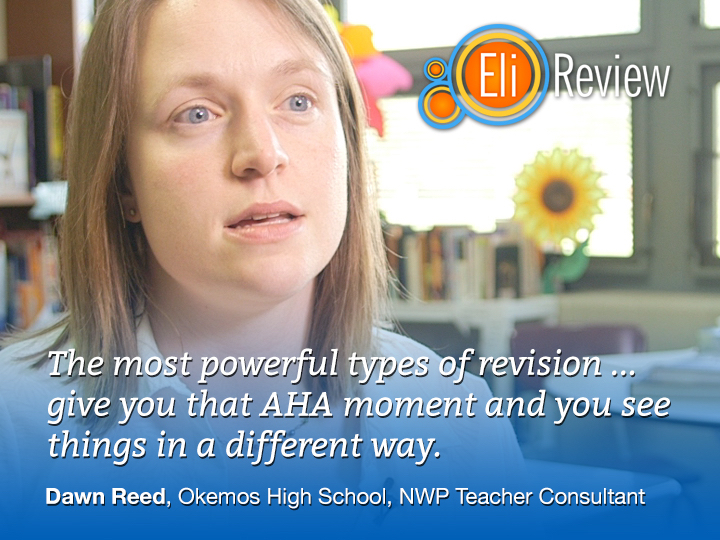 Because you can see review and revision in detail, you can teach it more effectively. Because students can see these, they can learn from one another in all the ways the idea of peer scaffolding promise. We hope you try it. We’ll make it easy for you. 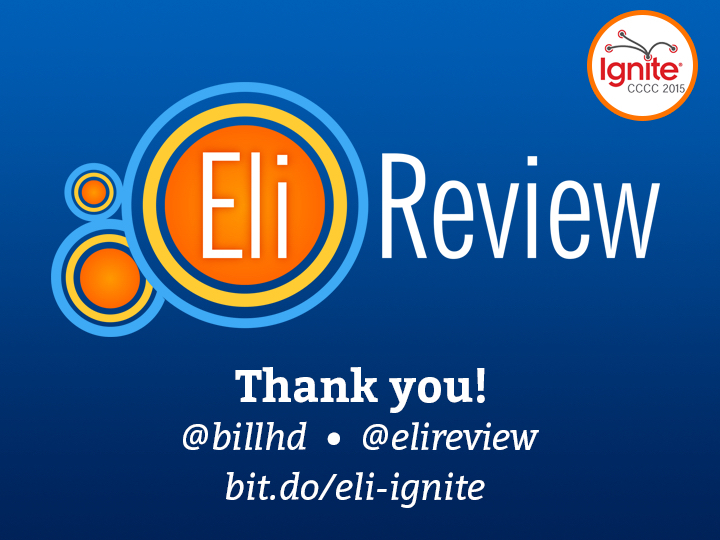 Bill Hart-Davidson and Eli Review at CCCC Ignite was published to the Eli Review Blog in the category Presentations.